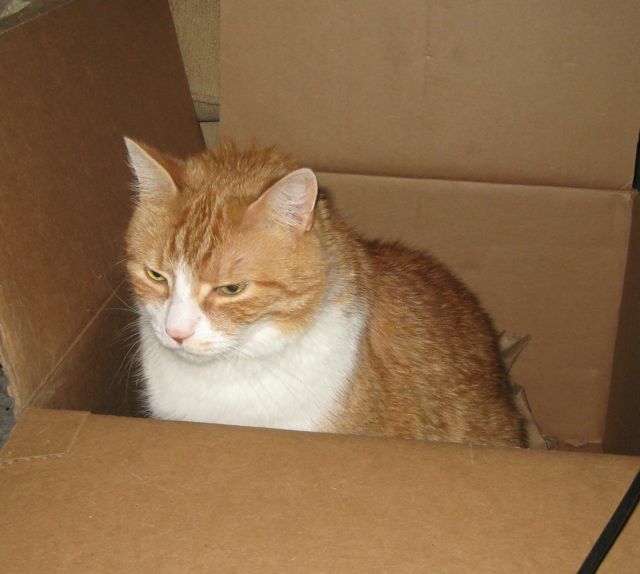 I don’t plan on blogging extensively about my cat, but once in a while, it may be necessary. And this is one of those days. Three amusing cat-related incidences have occurred in the last few days. Unfortunately, I didn’t capture any photos or video of my six-year-old cat’s first bath. It took two of us just to hold him and wash him, so we didn’t have a photographer. But, surprisingly, Cat handled it pretty well. I followed the rules I had read online: run just a few inches of water first, keep it a mild temperature, put a towel in the bottom so he can get a good grip, and trim the claws ahead of time. When the time came, I bribed him with treats first so he’d be happy and not hungry or whiny to start, then carried him upstairs to the ready bathwater. He whined and clawed a little at first (I have one cat-scratch paw print on my leg), but once he got settled and realized nothing too terrible was going to happen, he seemed to almost enjoy the attention, massaging, and cool water. I am relieved he handled it so well and happy to have a cleaner kitty. Besides the fact that Cat likes to squint in photos, you might also notice that he’s a rather plump kitty. To work to remedy this, I’ve purchased “Weight Control” cat food on a few occasions. Cat does not seem to like the diet food very much. A few months ago, he seemed to take to it ok, but the last bag, he all but refused to eat unless he got really hungry. It sat in the back of a cabinet, forgotten, until I purchased a new bag, and realized, “Hey, I should try to get him to eat up this old food first.” So I’ve been mixing the older diet food with regular food, about half-and-half, until today, when I realized why Cat didn’t like the diet food. 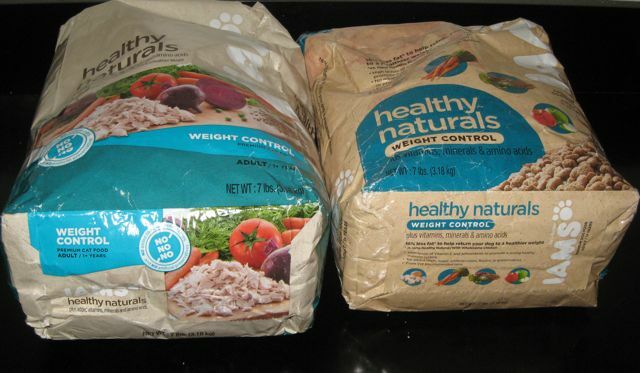 Pet food manufacturers, especially Iams: Please make your cat and dog food packaging significantly different with large, high-contrast pictures of dogs and cats so one does not have to look too closely to see which is which. Safeway and store stockers and managers: Please look closely at pet food bags and make sure they are stocked in the appropriate shelf area. 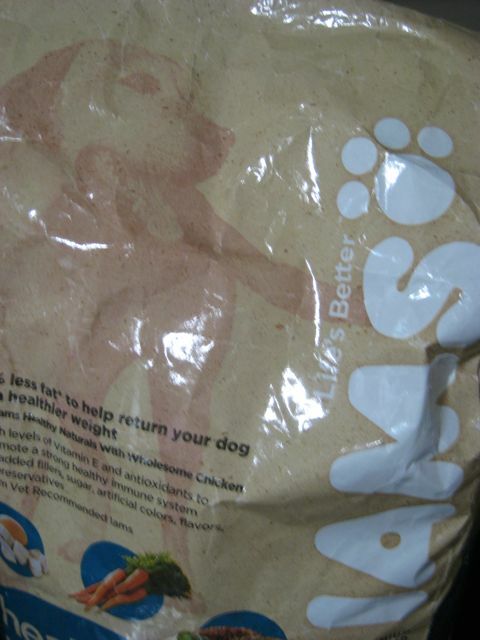 Pet owners: Please look closely at the bag before purchasing it to make sure it is the right kind of food. Looks may be deceiving. A few days ago, as I was headed out on my bike to a Nationals/Braves game, I noticed a guy on his bike calling out, “Slinky! Here, Slinky! (kissy noises),” clearly looking for a lost pet, flyers in hand. I asked him for a description of the lost pet. He described a cat with distinctive black/white/grey swirly spots/stripes; I said I would keep an eye out and headed on my way. After the game, I biked home, sweaty and tired, and dragged my bike back into my basement. Fast forward to today. I headed down to the basement to take care of some laundry, and noticed “Oh merde, I left the basement door unlocked again!” It had happened once before after bringing my bike back. This time, the door was open a few inches, and I scanned the basement to see if anything was out of place. All seemed fine, and I secured the door and made a mental note to not let it happen again. 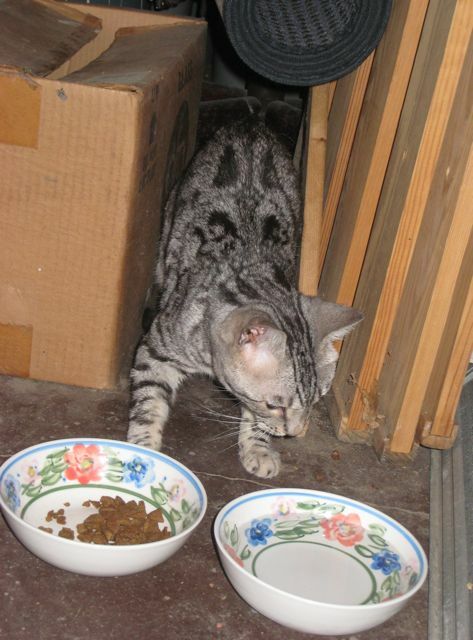 I found Lost Cat cowering among some piles of stuff in the front basement area, brought him down some cat food (regular cat food, not diet, not dog food) and water and went out to find the phone number from a flyer. I called the owner and left a message and kept checking on Lost Cat as I waited for them to call back. 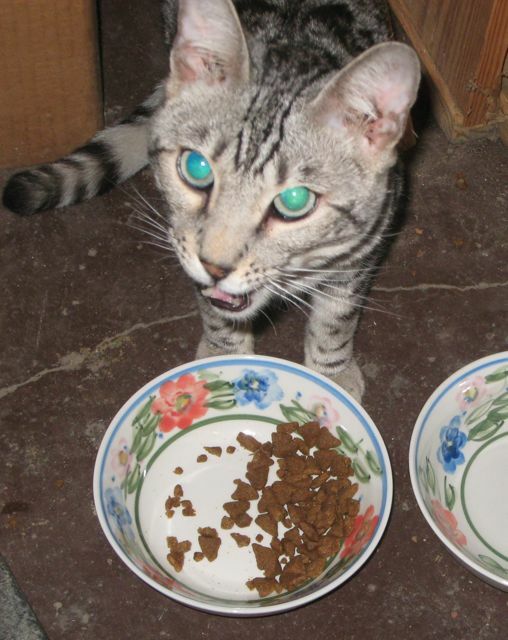 Lost Cat seemed scared, but happy to have some food and water. About a half-hour later, a lady called back, cautiously optimistic that I had found her family’s cat. She and her adorable twin boys, about nine years old in matching soccer uniforms, came over, identified the cat as theirs, coaxed him out of hiding, and happily took their mewing cat back home. Lost Cat was now Found Cat! I was happy that my carelessness had resulted, not in an evil intruder, but in providing shelter to a sweet kitty during a couple days of thunderstorms and heat. But I’m still going to lock my basement door next time I bring my bike back in.